COMMERCIAL fisheries are easy, right? Well, not always – and fish are not evenly spread. We’ll help you catch more with this quick guide. Islands are another obvious hotspot, and presenting baits as close as possible will certainly produce plenty of bites. Islands are an excellent all-year-round feature. ANGLER’S MAIL editor Tim Knight discusses angling jobs and how to get a job in fishing. Share the blog with friends on Facebook and Twitter by clicking icons above, or simply by telling people! 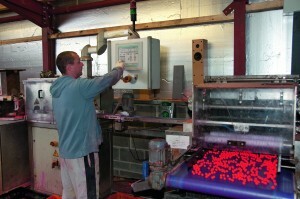 Making bait for a living – just one of the many, many jobs in the UK angling industry. Commercial fisheries’ best swims revealed!